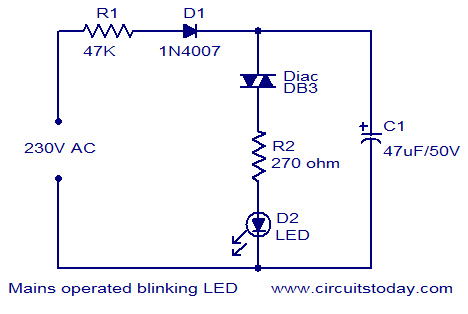 The circuit diagram of a blinking LED that can be operated from the mains supply is shown here. The working of this circuit is as follows. When mains power is switched ON the capacitor C2 charges through resistor R1 and diode D1. When the voltage across the capacitor becomes greater than 32V ( break over voltage of diac DB3) the diac conducts makingÂ the LED blinks andÂ capacitor C1 discharges through the LED.This cycle repeats again and again . 230V is potentially dangerous , be very careful while handling this circuit. The timingÂ of this circuit depends on resistor R1 and capacitor C1. If we want to place more than one LED….? Without changing the circuit and wattage of components can we increase the number of LED’S ? Hi Amit read it as C1. There is no C2. i need a circuit which is main operated and which can glow 100 led’s of 3 colors in total 300 led’s alternatively. Thanks for posting this, but I would like more of an explanation of what’s going on here. Are there any more in depth instructions on how this works? I have a 230vac compressor in my garage. When I need to use it, I turn on the master switch. If the tank pressure is <85psi, the pressure switch closes, energizing the compressor. When tank pressure reaches 135psi, the pressure switch opens and shuts off the compressor. When I am done, I usually forget that the master is still on. Approx 2-3 days later, when the pressure drops, the compressor comes back on unattended. This circuit would remind me to turn off the master switch when I am through. The LED I'd like to use is Allied Electronics Stock #70015427. I aquired quite a number of these from a project years back and they are quite visiable even in direct sunlight. sir, may i know the advantage of this ciruit?? Thank you very much, this is a great help. Hi MWm you cannot use a trac in place of Diac. diac is nothing but two zener diodes connected back to back its voltage lie between 27 and 33. you can use two 24volt zeners back to back. can one use a triac in place the diac, and is the circuit terminals connected to both live and neutral wire or to live wire alone? YA SEETHARAMAN U R REALY RIGHT. Hi friends through 47K 5mA current is available for C2 to get charged once it is charged to 32volt approx(depend on the diac sample) the diac will conduct and through 270ohms LED will draw current plused current drain can reach 100mA. The capacitor will get discharged instantly hence you get a blink from the LED. the capacitor gets discharged and ready for the next cycle. 47k is sufficient for R1??????? From the above circuit it looks like the effective voltage across the diac, the resistor R2 and the LED is 32 volts. Basically this will be the effective voltage across the resistor R2 as the other 2 component doesnt have potential drop when conducting. Would the resistor hold that much current and will the LED sustain that amount of current? Kindly let me know.